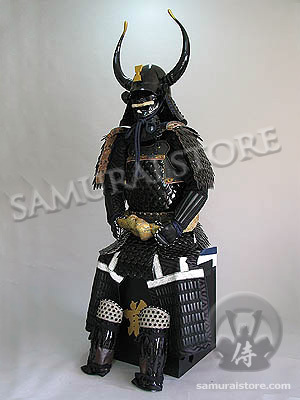 This beautiful black Yoroi is constructed with handcrafted iron fish scales "Gyorin Kozane" modeled after some historical examples such as Takenaka Samurai clan's armor. The body armor constructed with hundred fish scale style iron pieces was actually inspired by the well-known heritage Gyorin armor of Hanbei Takenaka. The acorn shaped helmet is comprised of 8 separate iron plates, each with its own specific proportions. When joined, they result in the perfectly formed kabuto seen here. This Yoroi armor comes with all parts and accessories listed in the charts below, and can be worn. Shoulder Guards - Black lacquered Fish scales iron guards.